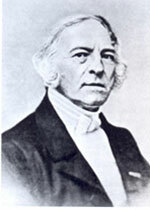 Theodor Martius, like his father Ernst Wilhelm, devoted his life to pharmacy. He completed a doctoral degree at FAU in 1824 and became a lecturer. Around 1841, he expanded his father’s collection of flora and fauna, for which he became known across Europe. The University made him an honorary professor in recognition of his contributions to the collection in 1838. Theodor Wilhelm Christian Martius sold his collection to the University in 1862 so that future generations would be able to benefit from it.